Trendy and modern! This is Made of recycled materials. Great to use for craft projects! Individually handcrafted with care. Add interest to any display with these kraft letters. Made of recycled materials. Great to use for craft projects! Individually handcrafted with care. Want to see your name in lights? Make special occasions even more memorable by putting these letters on cakes! The possibilities are endless! This product comes in assorted colors. Choose your letter/s! Liven up your room with this unifying symbol. Whitewash frame. Ask us for our design backings. Made of recycled wood materials. 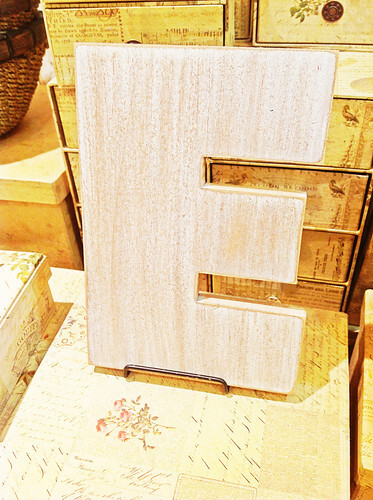 Display your name or favorite words with these letters. Pastel colors available. Ideal for wedding decor. You may order another color. Made of recycled materials. Attach these cutesy letters to different craft items. Personalize gifts! Available in pastel colors. You may order another color. Made of recycled materials. Display your name or favorite words with these wall shelves. Crackled white finish is shown (letters and base). You may order another color. Made of recycled materials. *Price does not include the letters. Form your name or favorite words with wooden bases. Varying lengths and colors. Crackled white finish is shown above (letters and base). You may order another color. Made of recycled materials. Size 8" x 1.75" x 1/4"
Size 7" x 1.75" x 1/4"
Size 7" x 2.25" x 1/4"
Size 10" x 2.25" x 1/4"
Size 11 7/8" x 1.75" x 1/4"
Thick font is useful for decorating with pictures, cloth, map paper as a gift. Use as a wedding decoration. Crackled white finish. You may order another color. Made of recycled materials. A popular wedding accent. Crackled white finish. You may order another color. Made of recycled materials. You can prop it up on a desk or little shelf. Form your own name or your favorite words. Available in pastel hues of green, baby blue, light yellow, pink and lavender. You may order another color. Attach this to your door, poster, magnet board, or plaques. Made of recycled materials. Form your own name or your favorite words. Available in red and blue. You may order another color. Attach this to your door, poster, magnet board, or plaques. Made of recycled materials. Form your name or favorite words. Use for children as a teaching aid for spelling. Plain black finish. You may order another color. Made of recycled materials. Prices do not include shipping. Prices and availability are subject to change without prior notice.